If you are like most drivers, you’ve probably gone over the speed limit, or maybe even parked in a no parking zone. 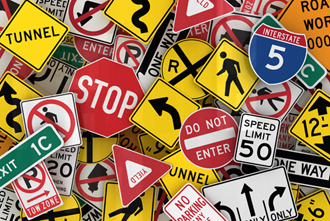 Overconfident drivers tend to be the most likely to ignore road signs. No matter how long you’ve been driving or how clean your driving record is, ignoring road signs puts yourself and others at risk. There is a popular theory that police will not pull you over as long as you remain only 5 mph above the speed limit. Even if this myth were to be true, you should always obey the speed limit. Pennsylvania has the third highest percentage of speed-related fatalities (43%), according to the National Highway Traffic Safety Association. Speed limits are calculated assuming ideal conditions for the road. In real life, ideal conditions rarely exist, so driving even 5 mph over the speed limit can have fatal consequences. We’ve all been there. You’re driving somewhere new and you miss your turn, so you decide to pull a U-turn in order to correct your course. While it might seem like a harmless decision, changing your direction via a U-turn in the middle of a road or at a No U-Turn intersection can put you and other drivers at serious risk. Because of the severity of the angle in a U-turn, you must significantly reduce your speed, and you are more susceptible to blind spots. In addition, you might misjudge the speed at which an oncoming vehicle may be traveling and you might not have enough time to complete the turn. Many drivers will “roll through” a stop sign if it is one that they encounter on their everyday commute. Instead of coming to a complete stop, they think that because there is “never” oncoming traffic that there never will be, so there is no point in actually stopping. However, ignoring a stop sign can have devastating consequences. This is an easy one to ignore. After all, what is the harm in stopping above the line, as long as you are still safely out of the intersection? You might not realize it, but the line indicating where you should stop at a red light wasn’t randomly placed. By stopping further back, you allow ample room for large trucks, which have difficulty making right-angled turns. Failing to stop at the designated line might result in a fender bender. It feels like some drivers choose to view yield signs as challenges; instead of slowing down, they speed up trying to beat the oncoming traffic. However, this is a dangerous practice, as yield signs are to notify you that the other cars have the right-of-way. A driver might not be able to see you, or might attempt to switch lanes to avoid a collision with you if you fail to yield. According to WorkZoneSafety.org, in 2015 there were 24 fatalities that occurred within roadway work zones in Pennsylvania. Failing to reduce your speed within a work zone puts the workers and yourself at risk. Have you been injured on the road due to someone else’s negligence? You don’t have to feel like you are facing this alone. Contact a KBG attorney to review your options.